TORONTO -- The Canadian dollar was trading near an 11-year low Thursday morning as Toronto and U.S. stock markets declined. 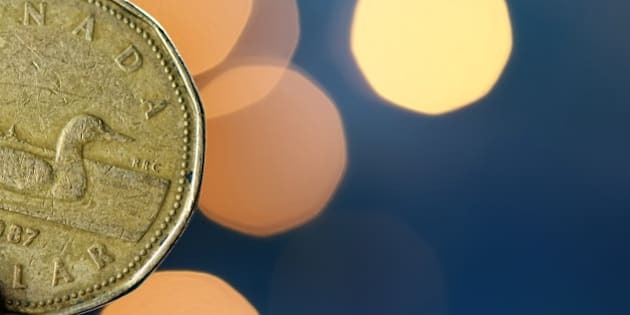 Loonie was down 0.16 of a U.S. cent at 74.76 cents US shortly after North American markets opened and had been lower earlier in the morning. The Canadian dollar is trading a the lowest levels since the summer of 2004. Meanwhile, the S&P/TSX index in Toronto was down 59.9 points at 13,323.79, adding to losses earlier in the week. It ended Wednesday down 107.40 points at 13,383.69 after tumbling 288.35 points on Tuesday. The Dow Jones average of 30 stocks was down 189.32 points at 16,090.57, the broader S&P 500 index declined 19.36 points to 1,919.40 and the Nasdaq index lost 51.49 points to 4,701.25. On the commodity markets, the December gold contract rose $21 to US$1,152.50 an ounce, the November crude contract was up 20 cents at US$44.68 a barrel and the November contract for natural gas was down one cent at US$2.63.